FREDERICTON -- Life in New Brunswick will likely get more expensive Tuesday, as the Liberal government unveils deficit-reduction measures that one critic warns will cost the province its competitive tax advantage. "Hang onto your wallets, because this is going to hit taxpayers hard," Kevin Lacey, the Atlantic director of the Canadian Taxpayers Federation, said Monday. A two-percentage point increase in the HST to 15 per cent is one option the government has been considering as a result of its year-long strategic program review to address a structural deficit of up to $600 million. Right now the harmonized sale tax is 13 per cent in New Brunswick and Newfoundland and Labrador, 14 per cent in Prince Edward Island, and 15 per cent in Nova Scotia. Lacey said any benefit the province reaps from the increased tax in the short term will be erased in the long run. "New Brunswick right now is at a position where, vis-a-vis the other Maritime provinces, it is at a competitive advantage. After the budget that competitive advantage is going to be gone and it's going to lose a major weapon it has to create a prosperous economy in a region that's all very similar," he said. "The HST is going to hit taxpayers hard who are already struggling under higher prices for things like food and other goods. It's really like squeezing water from a stone because taxpayers really don't have any more to give." Progressive Conservative Leader Bruce Fitch says the government will be "taking the lazy way out" if it raises the HST. "All businesses and people will feel the effect of any HST increase so the priority of jobs and economy has been put on the back burner and replaced by a tax-and-spend government," Fitch said. The government is also considering a corporate tax hike, the implementation of highway tolls, and civil service cuts. "The other Atlantic provinces are wringing their hands seeing these taxes go up because they won't have the pressure anymore of having a lower tax jurisdiction at their border," Lacey said. He said tolls are really a double tax because New Brunswickers are already paying for the roads every time they gas up, through gas taxes. Lacey said Nova Scotia is considering new highway tolls and will be looking to New Brunswick for the licence to proceed. Last week, Nova Scotia Premier Stephen McNeil said it was up to New Brunswick to determine the best location to put potential tolls, but hinted the border wasn't a good idea. 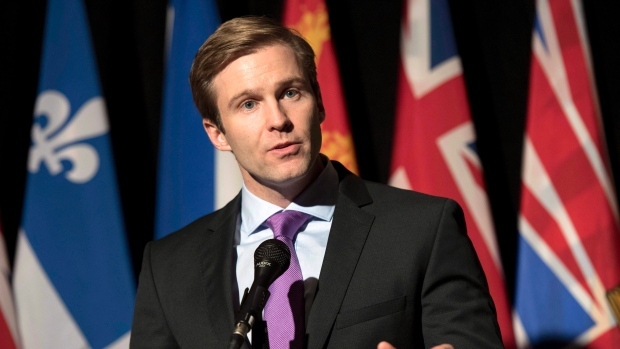 Premier Brian Gallant has stated that spending and revenue measures will balance out 50/50 over his government's first two budgets. He has already reduced the size of cabinet and the number of deputy ministers. Gallant and the cabinet ministers also took a cut in pay. Savings in last year's budget were $115 million. A government source told The Canadian Press that cuts to the civil service, including a 30 per cent reduction in upper and middle management, will save $46 million in this budget. The provincial debt is roughly $12.4 billion, and interest payments alone are about $700 million each year.